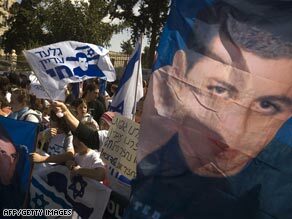 Hundreds of people in Israel made a show of support Friday for the parents of abducted Israeli soldier Gilad Shalit. They gathered at a protest tent erected by Noam and Aviva Shalit in front of outgoing Prime Minister Ehud Olmert’s house in Jerusalem and demanded that he develop a deal to release the soldier. The Shalits have moved from their home in Israel’s Galilee region to the tent across from Olmert’s home, a step designed to increase pressure on the government to get their son freed. They have vowed to stay there until Olmert ends his term as prime minister. Palestinian militants crossed into Israel from Gaza in 2006 and kidnapped Shalit. Talks on a deal to release Palestinian prisoners in exchange for the release of Shalit have been ongoing through Egyptian mediation. Olmert has said that he is committed, in the time that he has left, to try to bring back Shalit. Israeli negotiator Ofer Dekel returned to Israel on Friday after spending a number of days in Cairo in an effort to move the process forward. Olmert’s spokesman, Mark Regev, said the prime minister “has no illusions that the process will end in success, but it is ongoing.” After Shalit’s capture, Israel launched a military incursion into Gaza to try to rescue him.